"I won't forget you, Keiichi, even if you were to forget about me, I would not forget." The final two installments in the five part Oh My Goddess! OVA series present more challenges to the unification of Heaven and Earth. 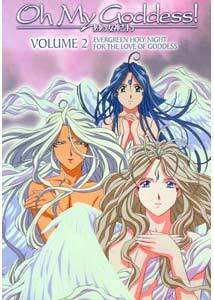 Having settled into their lifestyle together in the past nine months, the teenaged mortal Keiichi Morisato (Masami Kikuchi) resides with his trio of goddesses, Urd, Skuld, and their sister Belldandy. Having goddesses, especially Urd and Skuld, as roommates is not without its difficulties, but Keiichi is coping well, and having Belldandy around more than makes up for her pesky siblings. But all is not well. Waking up to find their yard full of snow, it is soon discovered that the anomaly is confined to their temple. While trying to clean up the mess to avoid the situation showing up on the evening news, Keiichi stumbles over something odd on the roof—one of the system bugs from heaven. Skuld, the official bug catcher, discovers that anytime Belldandy and Keiichi are in close proximity, a gateway is opened and the bugs are causing an imbalance in the Earthly plane. The only solution is for the pair to remain apart, which makes both of them miserable, especially when Belldandy is given three days notice to return to Heaven or else. Time is winding down on Belldandy's stay on Earth and part of her leaving is to remove any trace of her existence from Keiichi's memory. While Urd and Skuld try to find a way to circumvent the orders from above, Keiichi sets out to prove his commitment to Belldandy, which to him, is buying a ring for her to remember him by. In order to do so, he takes on a number of odd jobs to pay for the gift. Meanwhile, Belldandy is trying to convince the Lord to grant her one wish—to stay with Keiichi—but it seems that Keiichi has an obligation he hasn't fulfilled, primarily because he doesn't remember making it. These final episodes add a lot more emotional depth to the series, expanding on what was already an excellent set of characters. The tone is certainly lighter on humor and heavier on drama, as the deadline approaches and Belldandy's recall goes into effect. This series has some exceptional design work, which adds to the presentation immensely. The story is funny and engaging, and allows the viewer to really connect with the characters. This series ranks highly on my personal list of favorites, and it is too bad that there is not more animated, since apart from these OVAs there is only the Ah! My Goddess movie, and the Adventures of the Mini Goddess series, which doesn't have the same relationship aspects to it. Image Transfer Review: Image quality is quite good overall�colors are bright, black levels are solid, and detail is good�but there are some issues that will be noticeable on higher end systems that don't affect others. This second disc shares the problem with cross coloration the first one did, though I didn't find this disc nearly as distracting. Audio Transfer Review: Audio again presents a number of options. The original Japanese track features a solid stereo soundtrack, with appropriate directionality, and an even tone. Dialogue is easy to discern, with the score sometimes being a little over dominant. The English dub track is a bit louder than the Japanese. Finally, you can play "dub your own Goddess" with the music and effects only track. Extras Review: The setup menu allows for a multitude of playback options, including full, partial or no subtitles, and language choice. The second disc contains another commentary track by dub actors Juliet Cesario (Belldandy), Scott Sompson (Keiichi), Pamela Weidner (Skuld) and voice director Scott Houle. Once again the commentary comes out of only the right speaker, with the soundtrack being in the left. This proves a bit distracting, but does allow the dub they are commenting on to be more easily heard. The extras screen adds subtitle options for the commentary and music only tracks, plus access to the slideshow feature. The episode selection menu contains the clean opening and closing credits (the subtitles on the credits are soft subs, so can also be seen by simply turning them off while watching the show), and a hidden omake: an ad for the Goddess Family Club. Finally, included is a recipe-style liner note card explaining that there are no liner notes! Visually stunning, with beautiful artwork, and an engaging, funny, and heart-wrenching story, Oh My Goddess! is a classic in the truest sense of the word. If it weren't for the video quality issues, this would my highest recommendation, hands down.